Google has recently announced the accessibility of Android 4.4, known as Android KitKat, the most recent upgrade to world’s most well-liked Smartphone OS. Google, which is well known for nicknaming Android’s mobile operating system for tablets and smartphones after desserts, for the very first time has chosen the brand-name’s candy for version name. Here is a post featuring 10 Great Features of Android 4.4 KitKat. At end of the last week of October, Google unveiled the Nexus 5 Smartphone finally in a simple blog post which heralded the onset of the Android’s 4.4 KitKat also. Google revealed the KitKat moniker first at the beginning of September, which actually was a bit of shock since we were made to believe that this new OS will be named as Key Lime Pie. However, with KitKat, Google gives a known candy tie-in, along with a mascot which probably was easier to make in a statue for Google lawn than the piece of a pie. As usual, this updated mobile OS reveals a host of latest features, and this post is on highlighting a few of the intelligent new touches coming with KitKat. The latest version of Android smartphone software intends to allow more number of smartphone users the access to its budding menu of the online services like driving direction voice-activated searches. 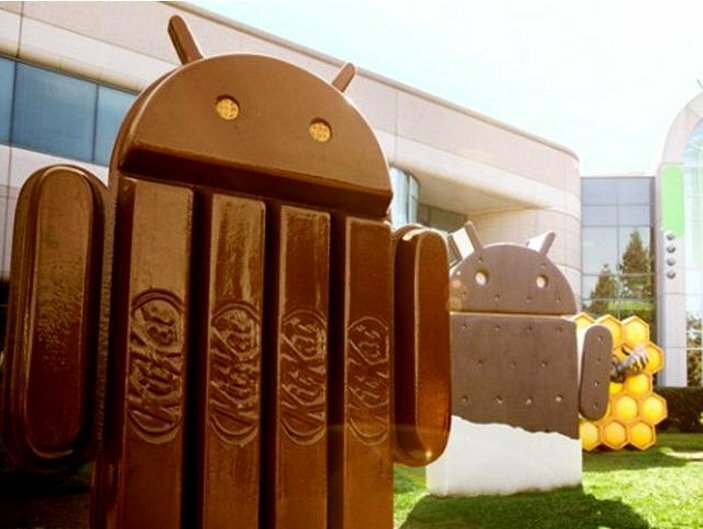 Android KitKat now will be competent to run on low-end, inexpensive smartphones in addition to the highly developed devices and this could also make Android software more striking to third-party applications developers, who have actually been frustrated by all what they call “fragmented” nature of the Android devices. Google, of course, is bringing much more than all this to table with this new Android 4.4 –you also can expect likes of updated NFC architecture, touch screen improvements, low-power audio playbacks, HDR+ photography, secure app sandboxes, and full-screen wallpaper with preview. Having mobile gadget is actually all about having quick access to all the things you require. To that end, the KitKat improves the touchscreen as well as optimizes memory, said Google, “in order that it responds more accurately and faster than ever before.” This means you simultaneously can listen to some music while surfing the web or when playing any mobile game with easiness. Another feature among the 10 Great Features of Android 4.4 KitKat is printing. Printing from any mobile device might look odd, but at times you need hard copy of some of your documents. Android 4.4 lets the users to print documents, web pages and photos from their tablet or phone. Users can print using any printer which is connected to the HP ePrint printers, Google Cloud Print, and other printers which have apps in Google’s Play Store. The search is at core of Google’s general product experience, company explained, so this is doing a lot more to make it accessible on mobile phones. Search now is by default on each home screen in Android, and supports hot wording, in order that you can simply say “Okay, Google” in order to get the search up as well as running at any preferred time, similar to you would on the Glass. Speech is vital for Google with this specific update, and Google said that it was bigheaded about these improvements so far; error rate of the speech recognition dropped to almost 20 percent in last year, and a 25 percent boost has been there in general speech recognition accuracy in the last few years, as per Pichai. Using the voice recognition now allows you also to tap one word and bring a list of different options to choose from. This system now also asks more clarifying question, using natural language, in order to ensure better services overall. With KitKat, the phone’s dialer gets an upgrading, as do a few calling features such as Caller ID. In order to help ease your guessing game, KitKat now will look for the Caller ID matches at Google Maps for incoming phone numbers which are not there in your contact list. Google generally has smoothed out UI to better underline apps over interface element, giving you much more room to play and work. Google promised much more visually pleasing movie art and album while the device is locked out, or you’re projecting contents using Chromecast. “You can now play, pause, or look for a particular moment,” said Google. This voice command of “OK Google” (as seen in the US with Moto X and a few Droid handsets) is also coming to KitKat. After set up, you could talk to your devices from across your room, waking that up with “OK Google” command. You can now ask it for directions, weather, sports scores, and movie times, or request it to play songs, make phone call, or text a friend. Is the contact list getting little heavy? With KitKat, the phone’s app will prioritize the contacts based on the ones who you talk with the most. “You also can search for your contacts, nearby businesses and places, or people in the Google Apps domain,” said Google. The last among the 10 Great Features of Android 4.4 KitKat is Hangouts. Google indeed has consolidated the entire video/ text/MMS experience with the Hangouts, as predicted. This replaces default messaging application, and lets you send SMS like you did before, to any number or to somebody in your contacts book. There also is new Places button to share map locations, and the emoji support is built-in to software keyboard finally. This is iMessage equivalent which Android had been lacking till now. This is really going to be an extremely useful feature, particularly for those people who are switching to Android from their BlackBerry.